There’s a term in the fitness world called the Minimum Effective Dose. What this phrase suggests is finding the minimum dose that will get you the most results. To the people who coined it, it involves lots of pushing and pulling and running and jumping, but it’s principles are easily applied to the world of home renovation. Looking around the apartment or house it’s easy to daydream about the changes that could bring out the most in the environment: knocking out walls, installing skylights. Yet, the minimum effective dose is easily applied here, too. Off-whites are the go-to color when painting, and it’s easy to see why. They’re unobtrusive, inoffensive and go with everything. Not to say they don’t have a place, but to rely on subtle creams on light grays is to lose the advantage that strong, bold colors can offer. Think of the bedroom: it’s a place to be comfortable, to cozy up in bed and feel safe. This is a perfect place to use dark colors. Unlike their pale-colored counterparts, darker hues offer a real sense of mood and personality. Choose something that fits your personality. This is your sanctuary, after all. Be brave and go bold. Dark wall paint colors also help benefit rooms that have less natural light. That may seem counterintuitive, but it’s not. Bright rooms benefit from light colors because they help diffuse that light. But rooms that have less natural light don’t benefit from off-white walls. Instead, they can seem darker and drabber. Strong colors help create space, instead, adding depth and character. Accenting with lighter-colored materials afterward really allows the room to pop, creating space and dimension. It can be intimidating to commit to a strong color choice on a large wall. Another option, then, is to focus on the accents. Keep the larger surface of the wall light, but use darker colors on the trim or moldings. This can add a real sense of dimension, giving weight to the room. This is a great opportunity to incorporate some braver color schemes into a room without worrying about them overpowering the space. If this still seems overwhelming, start small. You don’t have to commit to changing an entire house. Start with a hallway or small bedroom. Use wall paint colors that give it a real sense of personality and let it be. See how you respond over time. If you find it distracting, you know that this type of approach doesn’t work for you. But you may find yourself intrigued. Give it a start and see where it takes you. 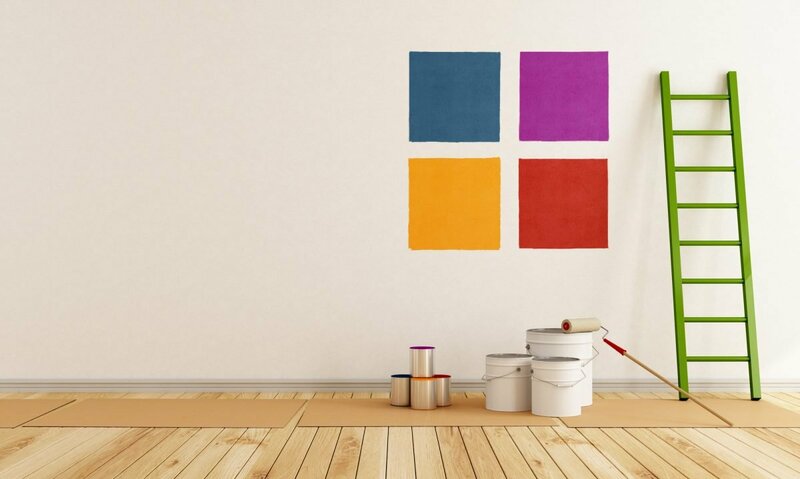 Changing the paint on the walls is one of the simplest steps you can take to redefining a space. With just a few cans of paint, some drop cloths and a free weekend, you can make the bold choices that will bring a whole new life to your rooms. If you have questions or need some advice, give us a call. We’re always here for your needs.